Enjoy the heady, innocent days before the war in Romance in the Air, a Fate world and adventure by Bill White, author of Ganakagok. In the skies over a fin de siecle Europe that never was, the aristocracy mingles in elegant comfort upon balloon-borne sky-salons and aerial lounges, dallying in an endless round of parties and excursions. But the winds of war are rising, and ambitious nobles rub elbows with scheming spymasters to decide the succession of a key Central European province. 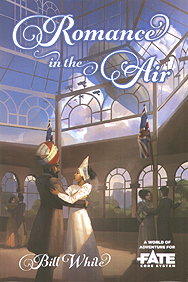 Romance meets high-stakes political intrigue as the affections of a young countess sway the fate of nations, while down below earthbound commoners look to the skies and dream of flight. It's Downton Abbey meets Last Exile on a collision course with Dr Zhivago. Airship systems, stunts, and samples to get you into airborne manoeuvres quickly. A map-based travel system that allows for random encountes and problems on each leg of the trip. Fight for your country... and for your heart.